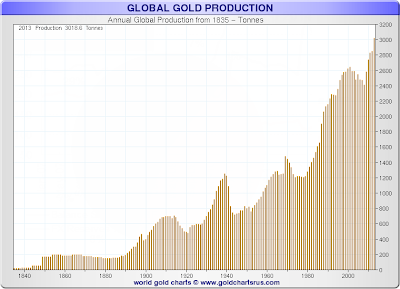 Mish's Global Economic Trend Analysis: Misunderstanding "Peak Gold"; Gold About to Run Out? 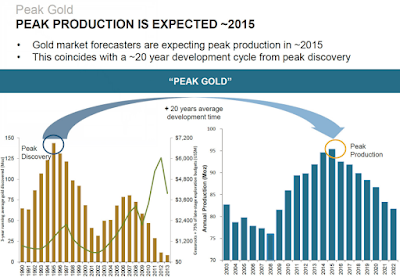 Misunderstanding "Peak Gold"; Gold About to Run Out? Is gold about to "run out"? The correct answer to that question is the likelihood of that happening is precisely 0%. However, that is not the conclusion one would come to from the Zerohedge headline Peak Gold? 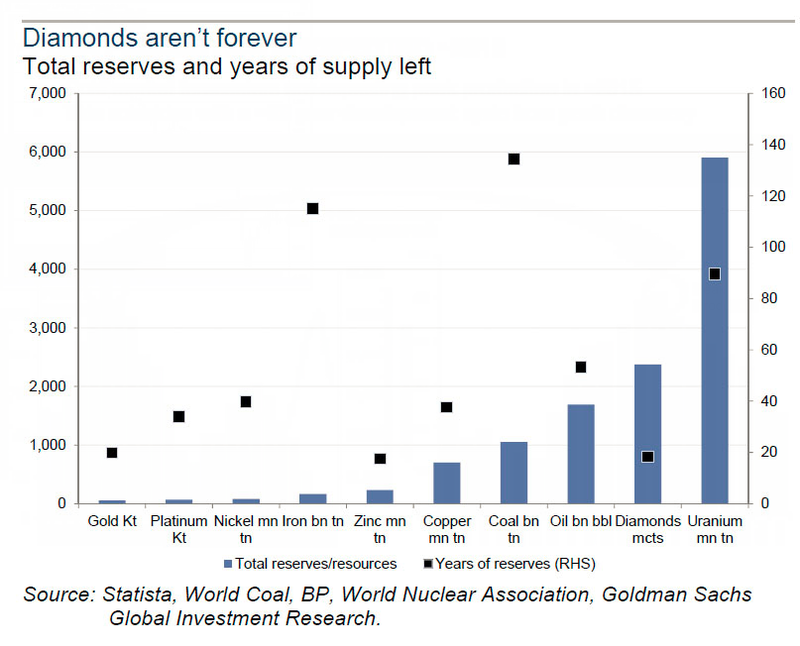 Goldman Calculates There Is Only 20 Years Of Gold Supply Left. Zerohedge supplied a couple of charts. Gold About to Run Out? 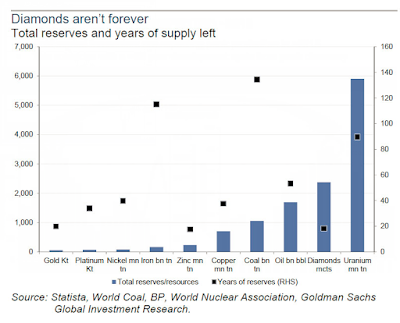 If the "known reserves" of gold plunge in the coming decade, no matter how many gold futures and GLD short sales are conducted by the BIS, the price will have to go up, and it will go up high enough to where a new surge of gold miners will come online and find thousands of new tons of gold reserves around the globe. 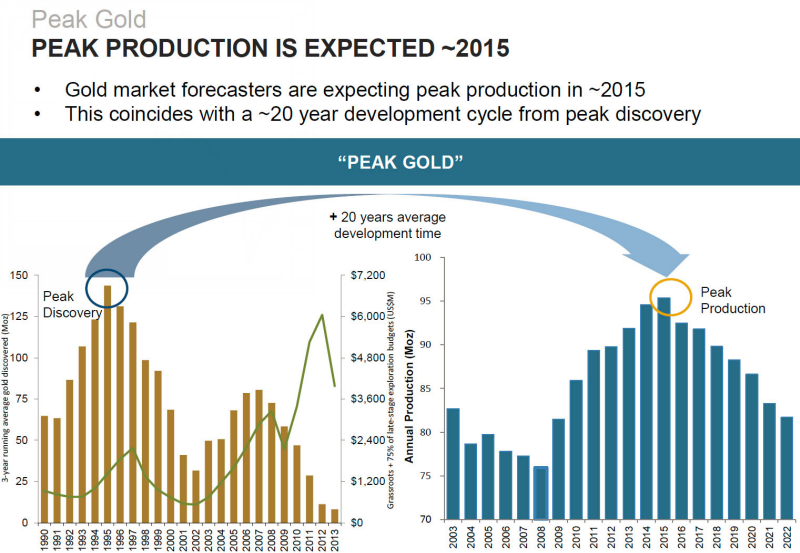 Unless they don't, and Goldman is correct that "peak gold" may have arrived. This will be even more true if over the coming years the long overdue fiat economic panic finally washes over the globe, and a revulsion toward central bank policies forces a scramble into gold whose value (if not price since fiat currencies will be redundant) soars. The answer is unclear, but what is certain is that like the price of oil over the past decade and until last fall when price discovery finally became somewhat credible, what happens in the physical realm has absolutely zero marginal impact on the price of commodity which has about 100 ounces in deliverable paper contracts for every ounce in underlying. It will be only after the gold price distortions via the derivative market are eliminated that such trivial price-formation forces as supply and demand are once again relevant. 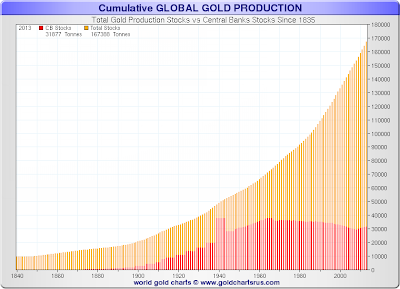 Gold is not about to run out for the simple reason that nearly every ounce ever mined is still in existence. In that regard, mining supply, central bank buying, jewelry demand etc. are essentially meaningless. I discussed jewelry demand and other topics in 2007, in Misconceptions about Gold. The article says written by Trotsky, edited by Mish. "Trotsky" was a spoof name at the time for who is now better known as Pater Tenebrarum at the Acting Man blog. A rising gold price usually begets falling jewelry demand, which is exactly what the theory of price elasticity would suggest. But at the same time, rising prices actually tend to stoke investment demand, just as a developing uptrend in the stock market tends to invite more demand rather than less. What's the Real Long-Term Driver for Gold? Most analysts are totally clueless about gold and gold markets. They cite jewelry, mining production, central bank sales, and all sorts of other irrelevant factors in their analysis. Gold is an asset. People buy it in order to hold it. The price of gold is set as people balance, at the margin, the amount of additional units of gold they want to hold against additional units of other assets or cash they want to hold, or consumption. If you think of the possible gold buyer as the guy who is saying, “Do I want to hold one more ounce of gold or this $1,800 that I have?” The answer to his question is going to be different for each person and for each additional ounce. 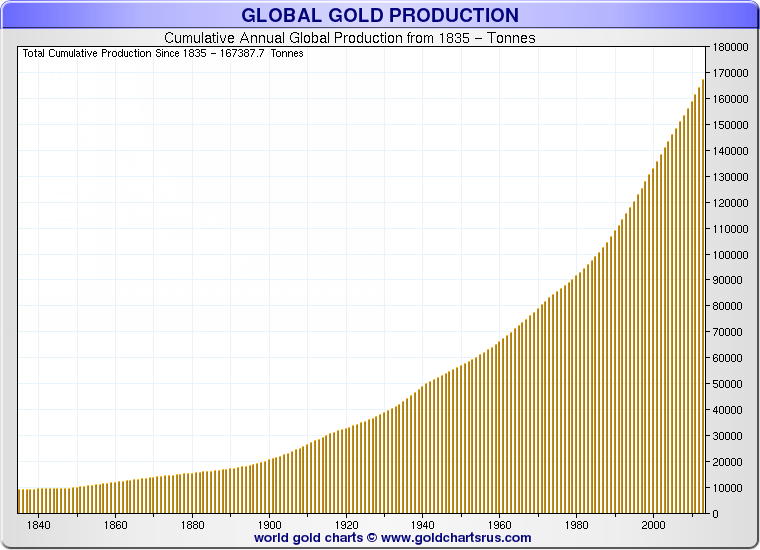 You might say “yes, I want one more ounce of gold instead of $1,800”. Now, you have an ounce of gold and if I ask you the question again you might say, “No, now that I have bought that additional ounce, I’ve got enough gold”. On the supply side, are the people who own gold. From their point of view they have to answer the question, “Do I want to keep holding this ounce of gold or do I want to sell it on the market and have $1,800?” That $1,800 might stay in cash or maybe they have another use in mind for it. The supply side is everyone who has any gold and the buy-side of the market is anyone who has any money that they might want to put into gold. The people who already own gold, they could be active on either side of the market as a buyer or a seller. I want to emphasize that everyone who owns any gold at all is part of the supply-side of the market, not all at the current price, but at some price. Many of the people who have bought gold in the last few years are not remotely interested in selling at the current price or even double the current price, but there is always a price or some combination of price and circumstances where somebody would put some of their gold on sale — maybe not all of it but some of it. And people on the money side of the market are asking the same question in relation to gold. The market balances all of those choices out and you have a price that brings out the quantities on both sides of the market into balance. Maybe that’s not totally true, maybe some gold is held by people who wouldn’t sell it for any reason. But I think that the concept of the gold bug who plans to take it all to the grave is over-stated. I asked a person the gold business whether gold retail trade is all selling and no buying. He told me, “No of course not, there are always buyers and sellers”. After all, what is the point of having a store of value if you never use the value? And it is important to understand the cost of owning gold is not necessarily the amount of money you could get by selling it. Prices are only a way of quantifying true costs. The cost of owning an ounce of gold is whatever other sort of economic opportunity that you are sacrificing by owning the gold instead. People who own gold are every day looking at “what other economic opportunities am I giving up by holding this ounce of gold?” and then “Do I want to shift the next ounce of gold somewhere else that will give me a better return or a better consumption experience?”. If you could swap an ounce of gold for one unit of the American Dow Stock Average that was at the time yielding 12% then the cost of owning an ounce of gold is not owning a unit of the DJIA. The cost of owning gold is the opportunity cost, of which holding cash instead is only one possible choice. Here are a few charts courtesy of Sharelynx Gold from my November 2014 article Swiss Gold Referendum in Perspective in which I presented the case the referendum was meaningless except perhaps from a psychology standpoint. Of the 2013 total (a bit higher now), central banks hold about 31,877 tons. 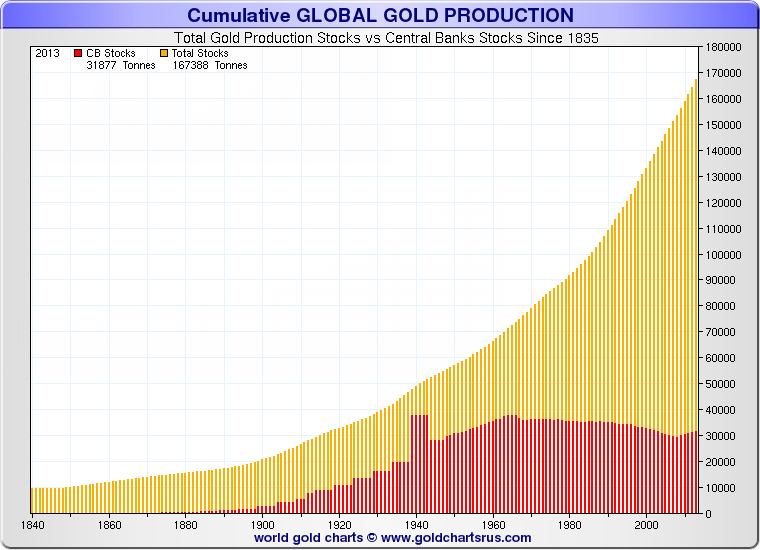 One must exclude central bank holdings from the amount of gold available for central banks to buy. And as stated earlier, one can subtract various other items like rare coins, but the overall numbers show that it's safe to conclude "buying 1,800 tonnes of gold over 5 years" is essentially irrelevant from a "gold available" for purchase standpoint. Discounting short-term psychology factors, mining is irrelevant, central bank purchases and sales are irrelevant, jewelry demand is irrelevant, and coin sales are irrelevant as factors in the price of gold. 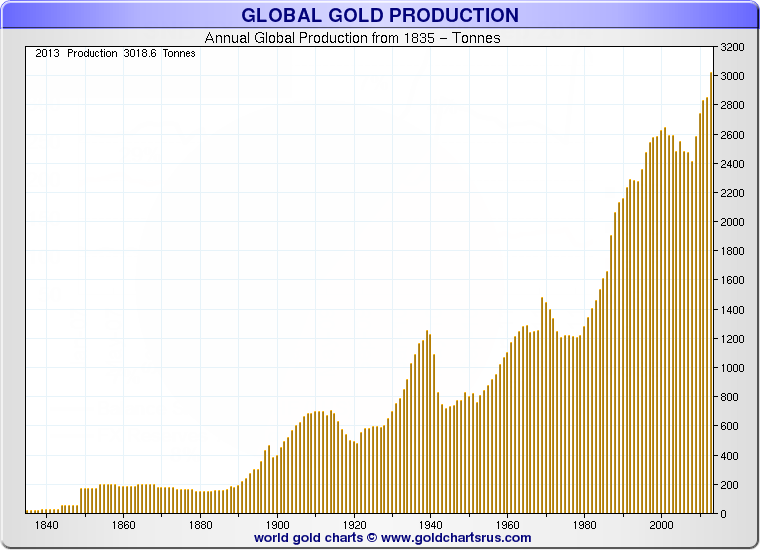 Finally (and much unlike oil) because nearly every ounce of gold ever mined is still in existence, the entire concept of "peak gold" cannot happen until mining grinds to a total halt.